Trip costs are very dependent on your lifestyle. I met one couple who lived on $200 a month for both of them, including maintenance. The other end of the scale is unlimited. Surprisingly, most couples (I met very few single-handers) were on quite tight budgets. I had budgeted for $500 CDN ($320 US) a month and that was more than adequate for me. Most of this was for food but quite a bit went for newspapers and magazines when I could get them. I virtually never used a Marina, at most places anchoring is the only option anyway. Very few cruising sailors ever go to a marina. Dinghy docks and showers were widely available for a $1. Anchoring was nearly always free. For the Bahamas I stocked up like everybody else in Miami and had most of what I needed for six months in terms of basics. Most people snorkel and catch fish and the odd spiny lobster every day and conch for salads. Bread and fruit is available on many of the Bahamian islands. I used an ice box and ice is widely available. Food and water are expensive in the Bahamas. I am a pretty basic eater and catching fish and my huge store of tinned fruit and cereal kept me in pretty good shape. Being a single-hander I was invited to dinner on more occasions than I would like to admit - I did try to keep a good stock of wine for such occasions, or chip in with something I had. Odd things happen too - a family who were having so much trouble with their engine decided to call it quits and told me their teenage kids would never eat tinned food at home and insisted I take their remaining supply - which lasted me about five months! On another occasion, I lent a guy, on a gigantic power boat, my battery to start his generators as all his batteries were flat and he was so grateful he gave me a crate (yes a crate) of very expensive whiskey. It turned out he was the owner of a liquor distribution company in Florida. In the Bahamas, major food supply is really only available in Freeport, Nassau, Eluethera and Georgetown on Long Island. You spend quite a bit too for water or juice, juice more frequently as water is hard to come by in the Bahamas. Taps are a rare thing in the Out Islands. Most of the water I used for washing clothes and drinking came from water wells that are surprisingly common on some of the islands of the Bahamas. During my whole two years I used only eight tanks of gas (12 gallon tank.) I managed to sail about half of the trip on the Waterway both ways. Once I left Florida I ran my engine once a week for 15 minutes to keep it lubricated. My single cylinder diesel would run for 8 hours at 4.25 knots on one gallon of diesel. There was always enough wind and I sailed on and off anchorage's where possible. There are all sorts of ways to make money while cruising. I met several couples who worked 3 months or so a year and cruised for the other 9 months on what they made and had done this for years. Jobs include bar tending and being a waitress (very easy to get jobs in the Florida Keys), skilled labour is in demand in the Bahamas, especially for maintenance of air-conditioning in resorts. Income can be made from cutting hair, painting names on dinghies, sail repair, any kind of boat maintenance at boat yards, etc. 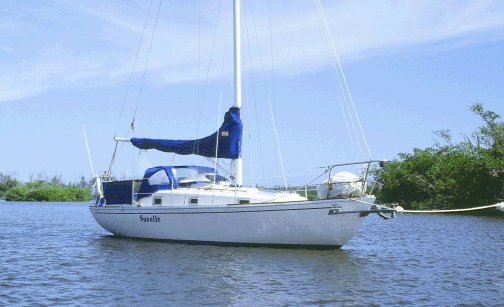 I got free docking, showers and meals for a few weeks in Florida, for doing some very basic PC consulting for a marina.